Paul Monroe (pictured below) will be a familiar name to those fans who have visited the Elvis underground. Paul was one of the key drivers of several underground messageboards and is now working on a book about his experiences. Linda Hood Sigmon (aka Shuma) has objected very strongly to Paul's comments about her in his interview. At the conclusion of the interview we publish Linda's response to EIN. As this is an interview and represents Paul's opinion (fact or not) EIN does not intend to remove any content. However, with Linda's response readers can evaluate each side and make up their own minds. EIN: Paul, thanks very much for taking time to talk with us today. Many fans wil not be familiar with your name. Please tell us who Paul Monroe is? PM: I am Paul L Monroe from Ft Worth,Texas, a relative of Bill Monroe & The Bluegrass Boys. I am a Sous Chef by trade & an entertainer & part time actor when I can get a good spot. I'm an advocate for the Elvis fans & yes Nigel many fans & Graceland know me very well. EIN: Bill Monroe & The Bluegrass Boys! That is fascinating. Were they a big influence on you? PM: It was a big influence because Elvis recorded his Blue Moon Of Kentucky & made it big and Bill Monroe himself if the Grandfather of BlueGrass music. EIN: How did you become an Elvis fan? PM: I was in middle school & the first time I ever danced with a girl we danced to Can't Help Falling In Love and she loved Elvis Presley. So me and a friend decided to dye the blonde hair Blue Black & buy as many Elvis albums that we could find and was determined to turn me into Elvis or the closest darn thing to him. Although the school relationship didn't last long the whole Elvis thing stuck with me throughout my life. The more I listened to his music and the more I studied I found Elvis was a great entertainer. EIN: How did you become involved in the so-called "Elvis underground"? PM: It all started when I was 15 working at the local Jack In The Box and I always ran the drive through as Elvis. I would talk like Elvis over the speaker and one day Jon Burrows came through and introduced himself to me as Elvis Presley & handed me the Elvis The Unquiet Grave book by Belkis. I also was good friends with the late Maj Bill Smith who produced the Sivle Nora album and he was associated with Johnny Harra and many other entertainers. He gave me tons of material such as photos, audio tapes and just told me all about Elvis being alive. I also only lived 5 minutes away from Jon Burrows & Connie..actually I still live near them. 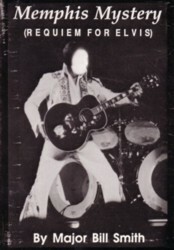 After researching and talking to people I found out alot wasn't right in the Elvis world and when I bought a computer the Elvis Underground opened up and swallowed me whole. Man I thought..these people are serious and I just have a way of getting in the middle of. EIN: What was it that attracted you to the themes expressed in the underground? PM: Many of things such as Jesse Garon living, Elvis being alive & in Texas and just the whole mystery behind Elvis's so called death and all the people around it that would do anything to keep it that way. Plus many of the people I met & talked to were really interesting and many were really creepy. EIN: By its very nature the "Elvis underground" is an environment affected by a great deal of hyperbole. Do you think that is that part of its attraction? PM: Yes & No becuase there are facts there but many of them are so exaggerated that it makes you wonder and it draws you in. Every member of the Elvis Underground has the same story but many are taken to such extreme measures it really makes for an interesting subject. EIN: Paul, you are currently writing a book about your involvement in the "Elvis underground". Please tell us about it and how it will be different to others released on the subject. PM: The book is called Elvis Alive The Truth Behind The Myth. It will cover Aug 16th all the way to today and will cover every theory and cover everyone involved. The proof will include everything that I have attained throughout the past 16 years that I have been involved in the Elvis world. It will also include an audio cd with every mystery voice since 77 up to 2007. 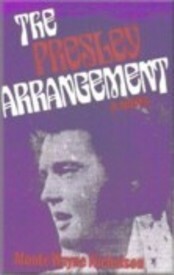 Unlike most Elvis Alive books mine will be one that comes from actual personal experiences. EIN: Please tell us more about the audio CD. 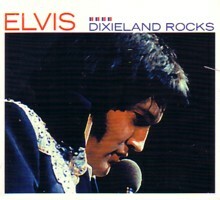 PM: It will contain every mystery song and every mystery voice that has been claimed as Elvis's. 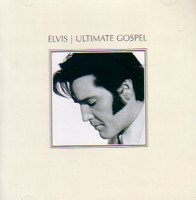 This giving the fans who have never heard many of these a chance to form thier own opinion on Elvis being alive. EIN: As is the norm in the Elvis conspiracy world some fans are likely to be critical of you and your book. Why should those interested take notice of your claims as against say those of the Presley Commission? PM: Everyone is critical of anything related with Elvis because many people sold out and told thier horrific stories about Elvis and the things he did and many people flat out lied about Elvis. A lot of the fans refuse to admit & accept that Elvis wasn't perfect and that he had many problems. As for the Presley Commission I don't agree at all with any of thier findings cause they were never paid by EPE and thier claims have alot of wholes in them. Me & Phil A have gone over this many of times. Plus I was involved with a lot of these people at one time or another. EIN: When do you hope to have your book released? EIN: Do you have a publisher yet? PM: A couple of them are wanting to publish it & I am going with the one that will best advertise the book and get it out there to the public. EIN: When your book is released how will people be able to buy it? PM: Well Nigel you can sell it on EIN and it will be available online and in bookstores. Stephen Chanzes: He produced the Sivle Nora CD & Video, He has also been in much trouble with the law for his many business that he had. Larry Blong: A fictional person created by R L Fleetwood aka Jon Cotner, Jon Smith and many others who also lives in Fort Worth, Texas. Larry didn't exist and the vocals you do hear are actually R L Fleetwood. Dr Donald Hinton: A poor fool that was suckered into believing that Elvis/Jesse was wanting treatment for pain and wanting him to be his Dr even though he never seen this Jesse face to face. Linda aka Shuma, and many others where the go betweens for this Jesse person. 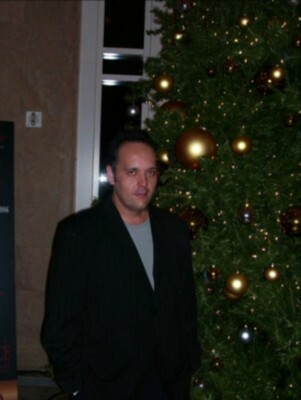 Elvis Presley Jr: Is not Elvis's son at all he disowned his own mother and refuses to accept her as his mother. I had a chance to talk to Delores Hart who he claims is his mother along with Bonnie Marie and they both say they have nothing to do with him and that they are not his mothers. Operation Fountain Pen: Operation Fountain Pen was the case that involved the airplane that was sold by Vernon Presley and there was some money issues and basically conned out of the plane. It did finally go to court and the men were charged and went to prison. DNA evidence Elvis is still alive: The DNA has more holes in it than Swiss Cheese. The Liver Biopsy, The Autopsy DNA and the Jesse DNA are all different. Nobody can really prove that the DNA belonged to Elvis..sure a DR had the Live Biopsy DNA but without some actual Elvis DNA its hard to prove that it is indeed his. It goes so many way that you get confused with it. Plus if it was actually concrete proof then there would be way more publicity about it. It came and went and died ! Unclaimed life insurance policy: The Insurance Policy was a Tour Policy stating that if anything happened on the road or during the tours the people would be paid. Basically a policy to cover the show promoters butts. EIN: What has become of Mary Smiley? PM: She is still active but keeps a low profile & she is in the works of a new book. EIN: In Europe the Elvis underground movement was largely run by Mariah Aaron. Whatever happened to Mariah? PM: The writer...lol... Yes I remember her.. she was caught in a web of lies and withdrew from things. EIN: Paul, the question those in the "Elvis underground" always ask! Did Elvis die on 16 August 1977? EIN: If No, is he still alive today? EIN: If No, do you have substantive proof that he didn't die in August 1977? EIN: If No, what has Elvis been doing since August 1977? PM: He is very aware of the Elvis Underground and isn't too happy with the way some people are using his name for thier own personal gain. EIN: If No, where has he been living? PM: He's been all over. EIN: What name has he gone by? EIN: If Elvis is, or was alive post August 1977, who in his inner circle knew/knows this? EIN: What about Jerry Schilling? He was always very close to Elvis and Graceland. PM: Of course he would have known but getting it out of people like him would be like pulling teeth. Joe E had an Elvis contest where the winner would spend a week with him and Joe could tell all about everything he knew and I also spoke to Joe E and buddy Daniel Lombardi and Daniel told me Elvis left 2 weeks before August 16th and that he had plastic surgery. EIN: EPE is a reasonably sized organisation. How has it kept the story "secret" for so long? EIN: If Elvis was alive post August 1977 did he have contact with his daughter, Lisa Marie? PM: Yes and she has made comments that her father is still around. EIN: There is widespread opinion that, to date, the anonymously written The Tupelo-Memphis Murders: A Study in Self Destruction and Murder is the most comprehensive overview of the themes and characters in the world of Elvis conspiracy. What do you think of this book? PM: I think the 3 authors did one hell of a job at it and the 3 of us have talked over and over about it and its alot of things that went on pre-fame. I think the book is great and urge the fans to read it. EIN: So you are one of the author's of The Tupelo-Memphis Murders? 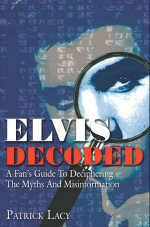 EIN: Running counter to the conspiracy theories of the "Elvis underground" is Patrick Lacy's recent book, Elvis Decoded. Have you read it yet and if yes, what did you think of it? PM: I have read half of it and ol boy is on the ball and like me he looks at things way different from the normal Elvis fan. EIN: What has Patrick got right, and what has he got wrong? PM: He has gotten everything perfect, He has talked to everyone thats anyone in the Elvis world and I think my book will compliment his perfectly. I must say its good to have a fellow researcher out there that has weeded out the BS from the truth. EIN: We are surprised you are so complimentary to Patrick's book, Elvis Decoded given it argues against your position. How do you reconcile this tension? PM: The book was well thought and well written, He has a right to his own opinion and makes some valid points in his book. 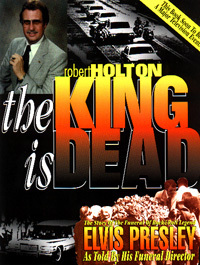 My book is going exactly by what people have said and done around the Elvis being alive movement.Everything I say is the truth and none of it is embellished what so ever because its things that we have already seen and heard but broken down in WHY, HOW & WHEN from recorded phone calls to emails and letters. It does argue with my book but the ending of my book has a very unexpected and suprise ending. I reconcile the tension with the thoughts of he like me is just a man with a story and he is telling his version of things like I am telling mine. I would love to talk to him over the phone just to talk shop. But I mainly just smile and agree to disagree. EIN: What is the most surprising thing you have discovered or realised during your many years as part of the "Elvis underground"? PM: That many of the fans out there and many of the people are really really off..I have been stalked, threatened, has people call me all hours of the night and show up at my home. Also I have found that you cannot trust anyone in the Elvis Underground. I love the fans and love the Elvis world but some people just want Elvis for themselves. 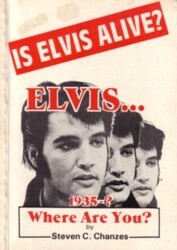 EIN: What is the most misguided issue those in the "Elvis underground" have fallen victim to? PM: The Dr. Hinton story..We all knew Elvis loved painmeds and Dr. Hinton was treating a patient with a known drug problem with narcotics and was prescribing thousands of them 65,000 to be exact. Along with the Jon Smith from Paltalk. This Jon Smith's real name is R L Fleetwood and he does sound just like Elvis. His voice is amazing but why would Elvis be on Paltalk anyways. Plus Belkis is running this blog just so she can sell her Jon Burrows story to people saying Burrows & Smith are the same person. EIN: Paul, is there anything else you would like to say? PM: I just want to say thank you a million for taking time to talk to me and hear my story. I love EIN and always read it cause its the most informative place for Elvis & Elvis related material online. Plus you put things out there just how they are and thats what the fans need is things blunt & honest. And if anyone has any personal questions for me I will be more than happy to talk to the fans and I love hearing the fans stories and just love the fans in general. Just to show what kind of guy I am heres my personal email address for the fans & anyone else that wants to ask a question or just talk or share a story. Email: paulnkimmonroe@gmail.com . Cheers Nigel & best for you & yours. Linda Hood Sigmon strongly disputes Paul Monroe's claims about her! The following is legal proof that the words you published were absolutely false and defaming. Please remove this statement from your web site. As you can see, I have posted this on my web site and also am sending copies to many of my associates. The purpose of this page is to show how careless EIN (Elvis Information Network) is in choosing the information which they display on their web site...publishing lies and trash and refusing to delete the slanderous and defaming statements once they are made aware of the lies. "Linda Hood Sigmon/Shuman: Shes a hoot.. She was the one who conned Dr Hinton out of 63,000 Hydrocodone under the guise of Jesse and she is a former Gatheringite who was banished from the group to start her Blue Light Group." (EIN Note: Official documents indicate the number was 34,000) "
Here are the true facts about the above....every single thing mentioned in the original quote was an out and out lie. Certainly the 63,000 which Nigel finally corrected in the footnote...Monroe's number was nearly double. #1. I did not "con" Dr. Hinton out of anything. Those who have read Jesse's book written with Dr. Hinton will know and understand that Dr. Hinton and I were loyal, devoted, and true friends to Elvis. #2. 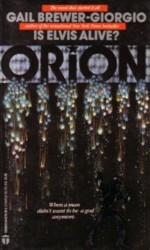 Yes, I was a supporter of Gail Brewer-Giorgio back during her book and newsletter publishing days. I contributed to Gail's books and newsletter and enjoyed being friends and sharing my knowledge with her. 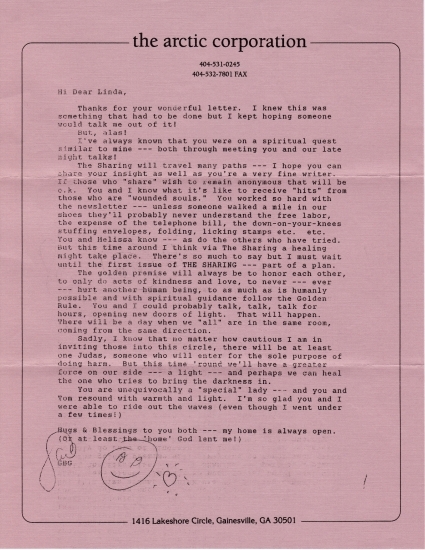 Below is a letter (and postmarked envelope) written to me by Gail in June, 1993 proving that she and I were still friends for a number of years after she stopped publishing her own newsletter and also proving that we were still friends several years after I discontinued publishing my own newsletter. I WAS NOT bannished from anyone's group. #3. My newsletter, which I published from July, 1990 through March, 1991 was published with Gail's blessings and good wishes. 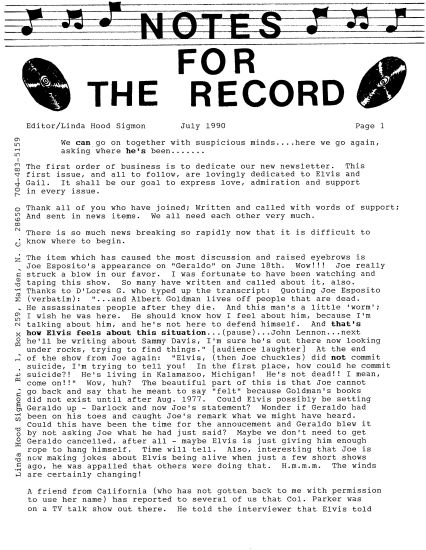 She also contributed items to my newsletter and kept me updated on many news articles.The title of my newsletter was "NOTES FOR THE RECORD". Below you will see the first page of my first eddition. I NEVER even subscribed to anything named "Blue Light" much less published such. In closing this article, I wish to state that this is my public notice to one and all...especially to Nigel,,, that the above constitutes proof that the statement he published is absolutely false, slanderous and defaming. By displaying documentation that every word spoken about me in the above shown statement is false, I give notice that I can show in a court of law that I have been slandered and defamed by EIN and Paul Monroe. I have consulted with an attorney and have been advised that the person who publishes that which is defaming is held legally accountable as is the person who actually spoke the words. Nigel, I ask you one more time...please remove your lies about me from your web site. Alan (Herts): I try to avoid your Elvis is alive stories as they encourage a fringe element. I succumbed and I wish I hadn't. Having read her response it confirms my suspicion that Linda Hood Sigmon is desperately trying to justify herself anyway she can. Pictures of envelopes she received from the queen of the genre, Gail Brewer-Giorgio. What next, a vial of Elvis's, sorry, Jesse's sweat or will her proof be a strand of his hair! AJ: Any reputable attorney would not take someones money for this BS. IMO, any disagreement should be between Paul & LHS. As most any news report will tell you ;"We report, you decide. " They've both had their 10 minutes of fame....time to ignore . BTW: I didn't see any proof from either side..
Sid: What planet are these people on? They need to get a grip on reality and get on with their lives!!! Susan: Shuma is a wonderfful person who has always cared a lot for Jesse. Paul Monroe is a horrible, nasty man who doesn't care about looking after Jesse. Brian: OK, Linda Sigmon knew Gale BG. So what? Where's the proof Jesse is Elvis??? James Lovett: Just had a look at the LHS site. She says Jesse gave her permission to use her own name to defend herself! What a load of shite! I thought women had been emancipated a long time ago. It appears LHS is living her life based on what this imaginary Jesse wants. I feel sorry for her and her husband if she has one. Terry: EIN can you please, please, please let this crap go. Hardly any fans believe it and those who do need help. 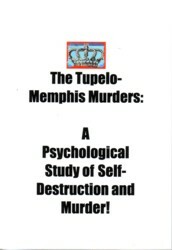 Freida Brenner: I bought The Tupelo Memphis Murders book and it was too well written to have been by Paul Monroe. Cathy Peters: I can't wait for Paul's book. It should open up a lot of people's eyes. Barry Martin: What a crock of s..t! Gillian: I for one doubt we'll ever see Paul Monroe's book. He's another big talker who won't deliver. Marti: There is much more to what happened to Elvis on August 16 1977 than most fans know about. Good on Paul Monroe for writing a book to let everyone know the truth.